Our Paleo Life offers a detailed list of recipes and snack ideas to help families eat healthier. Creating beautiful graphics to reflect the site’s unique message. Our Paleo Life wanted a simple, yet visually appealing site that would be easy for their visitors to navigate and quickly find what they were looking for, as well as utilizing a Responsive design that would be easy to navigate on mobile devices. 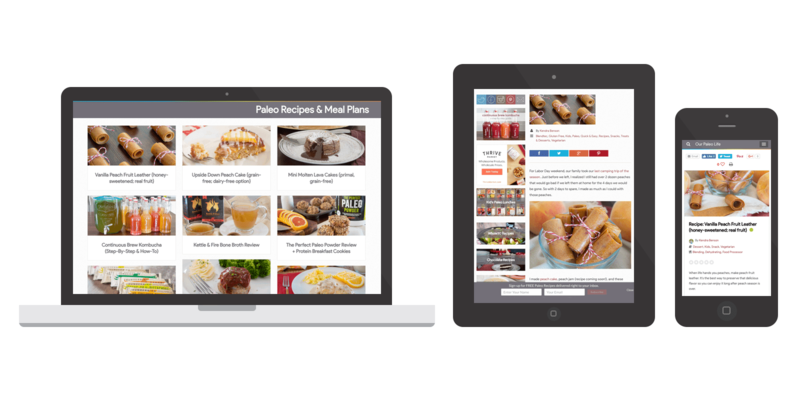 The site was reorganized and the layout modified to put emphasis on the featured recipes. The color scheme and logo also got an overhaul to more accurately reflect the content without detracting from it. All site graphics were created by Spark Logix Studios to continue with the new simplistic design. This makes it easy for visitors to understand more at a glance without having to read too much. The graphics are simple, clean, and easy.